Yet another female-fronted symphonic power metal band? Frankfurt's Arven does it better, five times better. Arven consists of five young gals at the forefront, and the only male forced behind his drum kit. One guy and five chicks. Don't go there, dude. 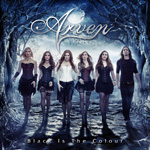 Arven: black is not always the colour. Fundamentally, Arven has the whole symphonic power metal sound nailed down pretty tight. With the gothic overtones and Carina Hanselmann's mezzo-soprano to soprano voice, they easily get the Nightwish, Epica, Edenbridge crowd. Yet with the strength of their power metal they could easily pull in the male side of things by appealing to fans of Blind Guardian or Sonata Arctica, for instance. After these things, the real questions that remains is Arven doing anything novel or better than their peers. Not necessarily, but what they do, they do very well. They've got a bit of the Celtic folk flair with the instrumental Cercle D Emeraude; a traditional duet with Stefan Schmidt of Van Canto on The One For Me, very nice; My Darkest Dream is the song with the best rock groove and single potential; Believe, Don't Look Back, and Black Is The Color are solid mainstream symphonic power metal. In other words, as said before, they understand their chosen genre quite well and craft some very good songs. If you like the style or you're a fan of the aforementioned artists, you'll be pleased with this album. Recommended. More than a female-fronted metal band, but one fronted by five ladies and backed up by a male drummer, Arven delivers the symphonic power metal goods with aplomb.